It has been a long time since I had reviewed a carrier. However, I couldn't resist trying out the MiaMily Hipster, which has been tested and approved by The International Hip Dysplasia Institute and Baby Carrier Industry Alliance as a hip healthy product. 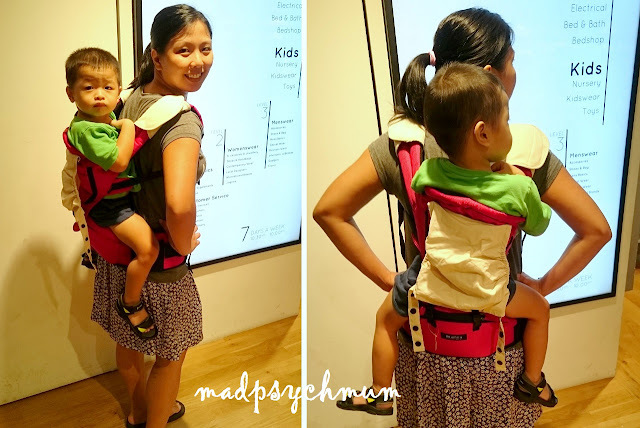 I've often gotten feedback that Hip Carriers are not good for baby's hips so this intrigued me to give it a try. I was given the ruby red, which was really striking and great for carrying both boys and girls. These white strap pads aren't the prettiest but they get the job down by protecting your straps from a teething baby or giving you additional support on your shoulders should you need it. Would be better if they were of a nicer colour or design though. The MiaMily Hipster comes with a foldable bag to put your carrier when you don't need it and folds up when you do. I thought that this was something very useful that other hip seat carriers do not come with. I know this position isn't the best for his hips but my super active boy loves it as he gets to see things other than my chin. I try to limit carrying him in this position for short periods of time. Carrying him like a backpack. 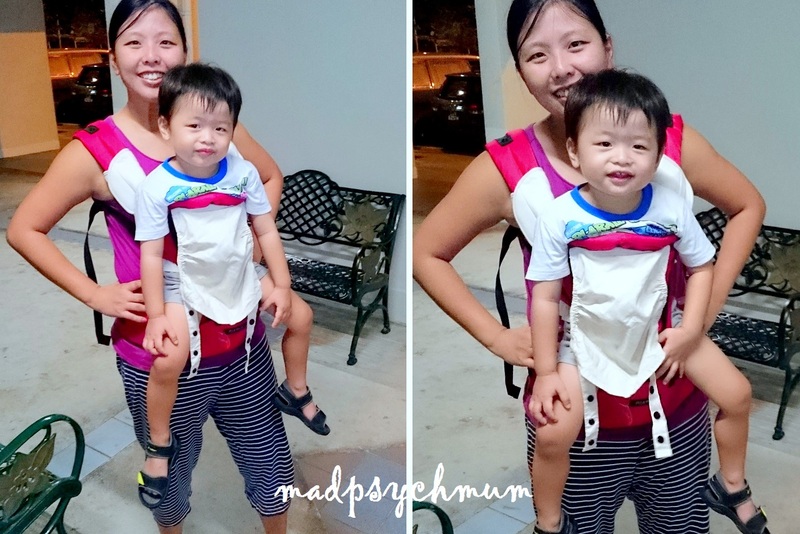 When using the MiaMily Hipster, I did notice that it does provide more support for my boy's legs as compared to my other hip seat carrier (which causes my boy's legs to droop more). 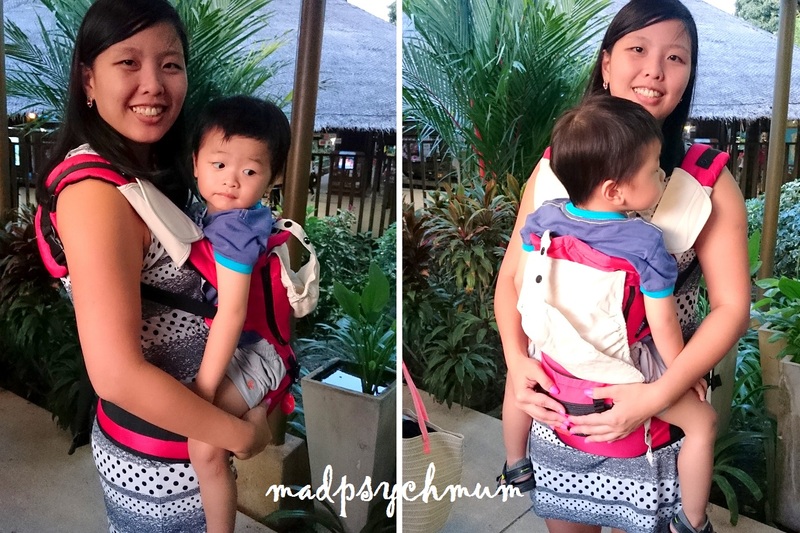 However, I also acknowledged that the support is still less than other cloth carriers so do weigh the pros and cons when deciding between the different types of carriers. Do also note that hip seat carriers are not suitable for very young babies who are not able to sit up by themselves. Well as you can see, all my favourite positions require the shoulder straps as I prefer to go hands-free. However, you may prefer to use it without the straps as some kids don't like to be strapped in. With my boy getting more and more active and climbing out of our strollers even though we had strapped him in, it's useful to strap him tightly into a carrier so that he can't get away (this is especially useful if you're shopping in a store full of breakables and you don't want your hyperactive toddler to destroy anything). One of the reasons why I still put my boy in a carrier even though he's getting almost too big for it. Disclosure: A complimentary baby carrier was received from MiaMily for the purposes of this review. No monetary compensation was received; all opinions are my own.